Halloween will be here before we know it and sometimes we need to think “OUT OF THE BOX” for fun and inexpensive costumes or in our case make them literally out of a box. That’s right! 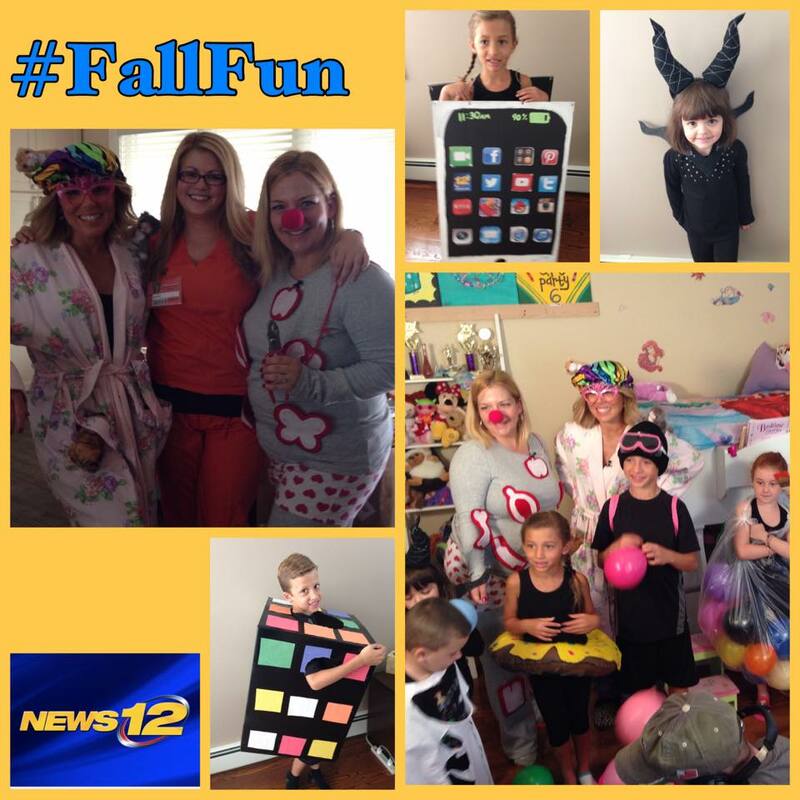 You read it correctly all of the costumes seen below can be made out of a box and done inexpensively. 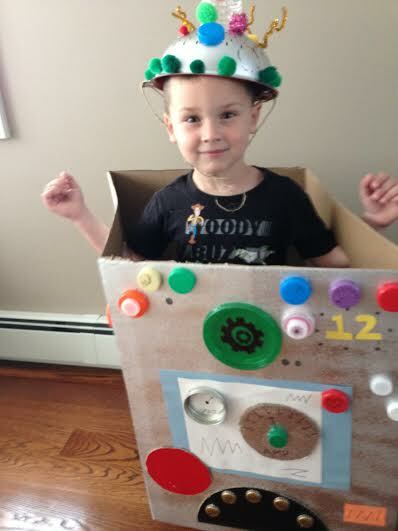 When kids are young they say they have more fun with the box the expensive toys came in then the toy itself. 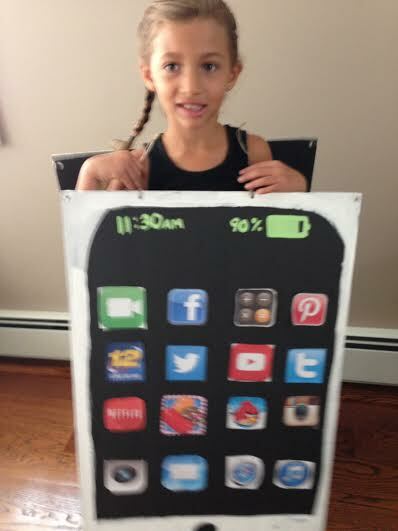 I would say that is 100% true even for Halloween costumes! 2. Once dry cut out two arm holes on the sides of the box and one hole on the top of the box where the head would be. 3. You do not need the bottom of the box I would just cut off those flaps. 4. 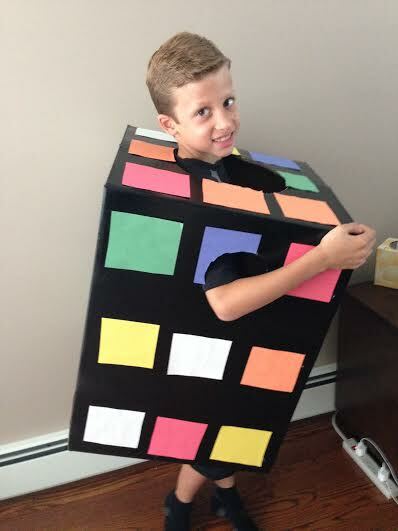 Cut out squares of the different color construction paper. 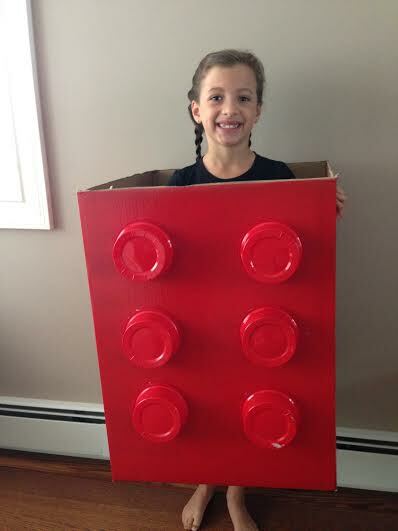 You will need 9 squares per side of the box and you will also need squares for the top of the box where the head goes. 5. 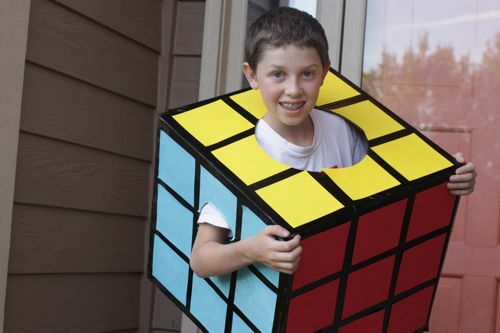 Hot glue the squares to the box and you are done making you rubix cube. Once dry, using your utility Knife or Box Cutter cut out the arm holes and cut off the bottom and top flaps of the box (you can leave the top and cut a hole for the head if you want like we did the Rubix Cube. 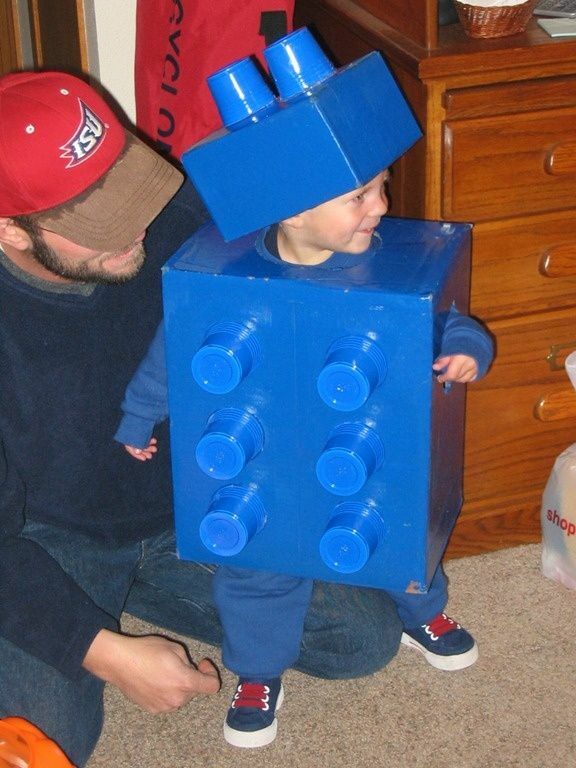 Then, hot glue the small containers to the box and you are done with your Lego costume. First, find images of the different apps and print them off your printer. 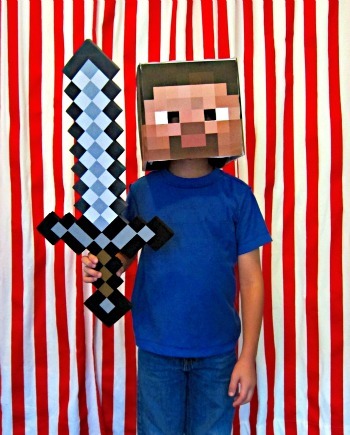 Cut the images out. Then, hot glue them to the board. Paint white around the board like I did to make it look like the outside frame of the phone. Paint with the Green Acrylic Paint the battery life and time. Hole Punch two holes on top of each side of the front and back cardboard piece. Tie the twine to fit together the two boards like a sandwich. And make sure that it will just hang on top of the shoulders of the person wearing it. 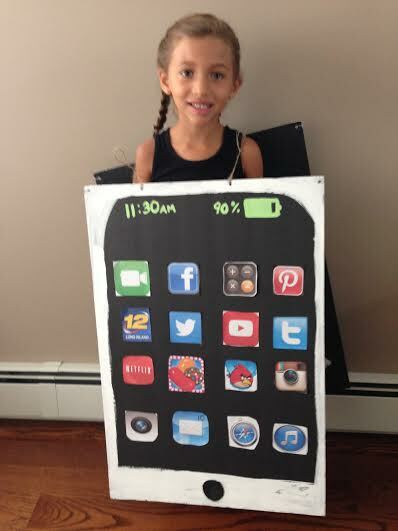 You have completed your I-Phone Costume. 2. Once dry cut out two arm holes on the sides of the box with your utility knife or box cutter. Also, using the utility knife (BE VERY CAREFUL) cut the empty water bottle in half. 3. You do not need the bottom or top of the box (but, you could leave the top like we did with the Rubix Cube) I would just cut off all of those flaps to make it easier. 4. 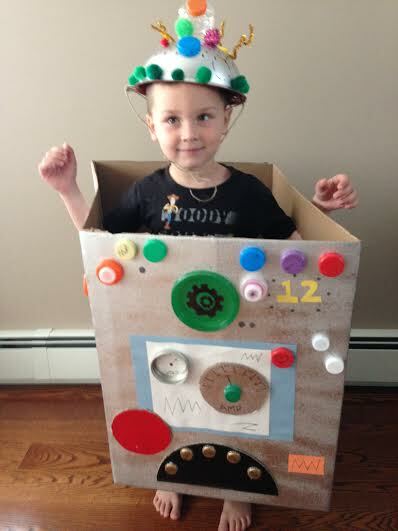 Now have fun and decorate your Robot Body Box and Colander Hat. Before you decorate the colander be sure to hot glue the half of the water bottle on top of the colander and then decorate around it. Be sure to be careful with the hot glue gun since it is hot putting on all of these little embellishments. If you put hot glue on a metal bottle cap that bottle cap will got hot quickly so be careful. 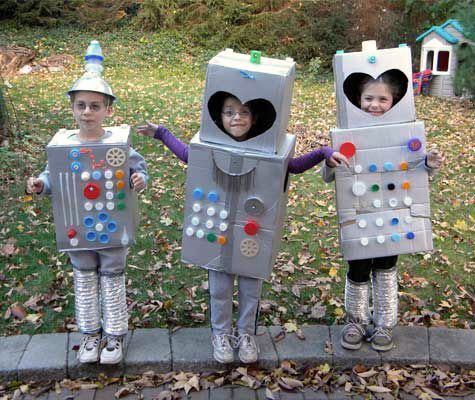 Once you add the embellishments you have completed your adorable Robot Costume. Using your utility knife or box cutter remove the top and bottom flaps of the box. Wrap the box with the Brown Wrapping Paper and tape to the box. 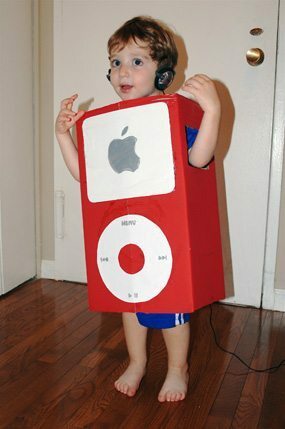 Then, cut the arm holes out with your box cutter or utility knife. Hot Glue the recyclable items to the box (or use Gorilla Tape) it works so great and stays secure to the box. Using a Sharpie Marker write GROCERIES on the front of the box. 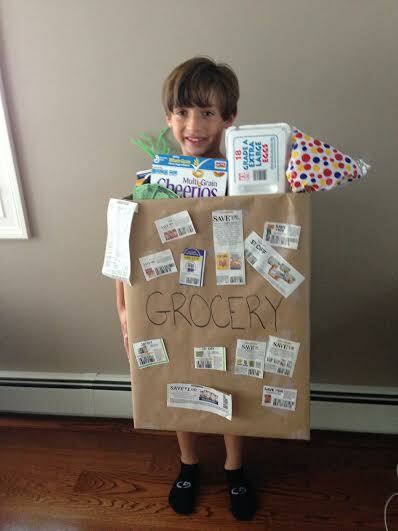 Tape the Grocery Receipt, Fake Dollar Bills, and Coupons to the box. First, mark off the squares (to make your head look like the computer pixels) onto the box. The squares should be about 1″ x 1″ with a pencil. Mark these on all sides of the box. I then filled in the boxes with the paint color and went by the picture below to count about how many boxes in to make the mouth and eyes. Once dry, cut eye holes where the eyes are on the box. 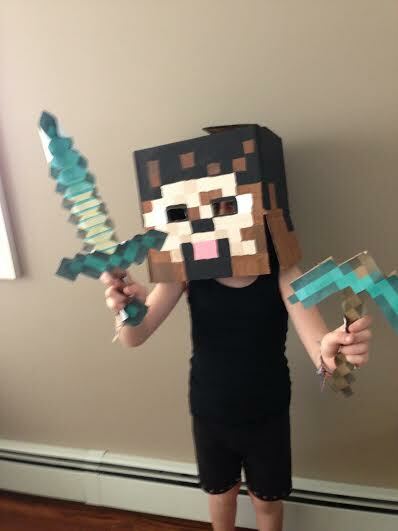 I then cut out a sword and pick axe shape out of the cardboard. And using my Printer I printed off the images found in the link below and glued them to the cardboard weapons. These downloadable images were extremely helpful and I think looked great. 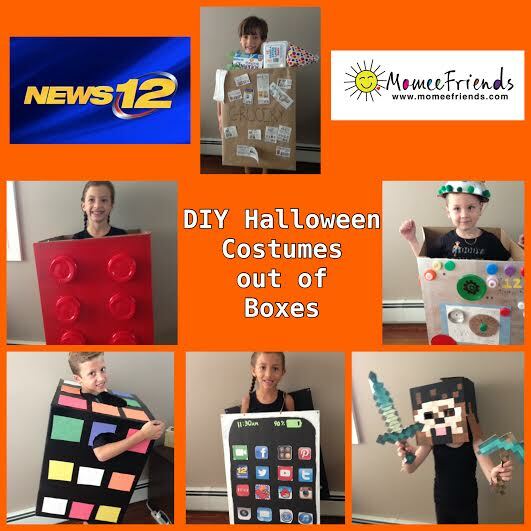 We hope you have fun making these easy DIY Cardboard Box Costumes and enjoy the segment with News 12 Long Island on these adorable costume ideas for this Halloween!